Set in the heart of Kapolei, this hotel is situated within the Ka Makana Ali’i shopping center, moments away from Ko Olina Beach, Pearl Harbor and the airport. Modern guest rooms, designed with Hawaii-inspired decor, feature a mini-refrigerator Wi-Fi, a mini-refrigerator, LCD TV, and a Hampton bed®. Take a dip at the outdoor swimming pool or tee off at the nearby Ko Olina Golf Club. 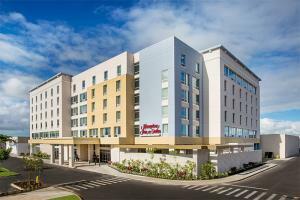 Located in Kapolei, Hawaii, about 15 miles from Honolulu International Airport.